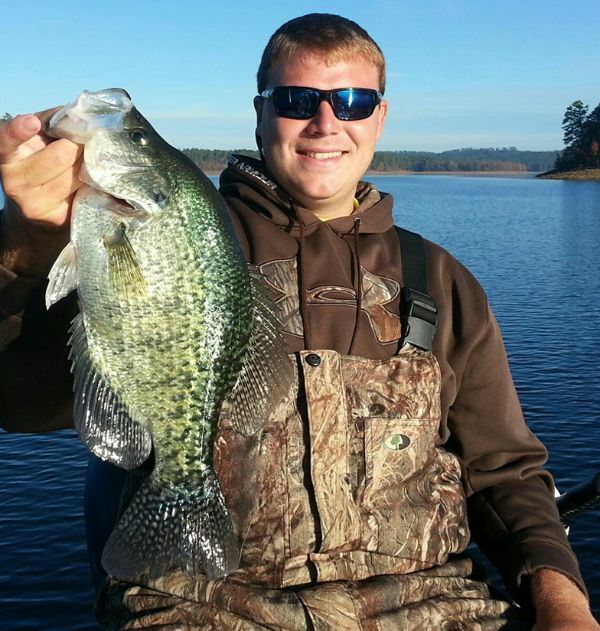 Thanks to Trey Reid and Arkansas Game & Fish for their special with us and their time spent on Lake Greeson! We are in the Spring crappie season. It's one of our best times of the year. Book your trip in advance to make sure you get the date that you want. If the date you want is taken, please check the SECOND BOAT. Click Here for our up to date Calendar / Schedule to book your trip! Click Here if you want to call or email us! Click Here to see what we've been catching! We'll fish for anything that is biting but we target crappie most of the time and we've developed a system for locating and catching them year around on Lake Greeson, about 45-miles southwest of Hot Springs, Arkansas between Murfreesboro and Glenwood. We are located at beautiful Swaha Lodge & Marina but we will pick up at any marina on the lake! Call them what you will - crappy, white perch, specks, sacalait, calico bass papermouths or whatever - we like catching them and love eating them! 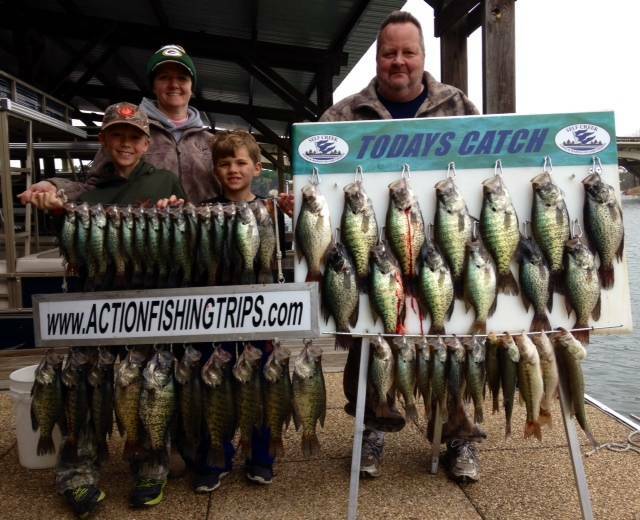 But most of all, we enjoy taking folks out on the water to "unwind" and spend quality time making memories with their family and friends while they catch a good "mess" of crappie. While fishing for crappie we often catch black bass, white bass, bluegill, catfish, an occasional striper or walleye and a few other species. I guide out of a very stable, safe and comfortable 22' Blue Wave Center Console Bay Boats powered by 200-horsepower four-stroke motors and equipped with Jig Poles and Crappie Rods from BnM Poles. I guide out of Swaha Lodge & Marina and recommend their cottages for your lodging needs. Youngsters are welcome and no fishing experience is required. Bottled drinking water, crackers, life jackets, bait and tackle are provided but you're welcome to bring your own tackle and favorite snacks and beverages if you wish. Sandwiches, pizza, beverages, ice and snacks are available at the marina. We're never far from clean bathrooms and we'll take bathroom breaks whenever needed. Fish that you want to keep are filleted and packaged for you. My boat can accommodate up to four adults(or bodies) and (or up to 1,100-pounds maximum weight) with plenty of room for everyone to fish comfortably. I offer half-day and full-day trips. Half-day trips are $350 for one or two anglers plus $25 for each additional adult and last about 5-hours including time for pictures and filleting fish. Full-day trips are $500 for one or two anglers plus $50 for each additional adult and last about 8-hours including time for pictures and filleting fish. There are no additional taxes or charges for fuel, bait, tackle, supplies, drinking water or snacks. If you're not sure whether you want a half-day or full-day trip you can decide after you see how the trip is going and talk it over with your guide. We usually start around sunrise but it's not always necessary to start that early, especially in the cooler months. We usually take a lunch break on full-day trips but you are welcome to bring your lunch if you prefer to fish through. Visit the Reservation-Calendars page to book a trip. Visit our Comments page to see what previous guests have said. Everyone age 16 and up will need a current Arkansas fishing license, available at any Arkansas Walmart or sporting goods store, by calling 800-364-4263 or on-line from the Arkansas Game and Fish Commission. Bring your camera, Polarized sunglasses, wide-brimmed hats, raincoats or ponchos (just in case), warm clothes and boots in cool weather and don't forget an ice chest for your fresh fillets! If you have friends or family members that don't care to fish but enjoy wildlife and scenery, bring them along. Bald eagles, osprey, great blue herons, waterfowl, deer, otter, beaver and other wildlife are often seen on a fishing trip. Click here to reserve your ACTION FISHING TRIP now!